With a combination of specialized equipment and trained staff, our programs are designed to encourage people of all abilities to enjoy the outdoors together together. We provide opportunities to develop skills and share outdoor experiences in every season. Activities include: kayaking, canoeing, cycling, camping, and hiking. In winter we offer xc skiing, sit xc skiing, ice skating, sled skating, and snowshoeing. Our programs are open to people of all ages and all abilities. We have programs geared for people disabilities and their family and friends, programs for seniors, and programs for veterans. See information about specific programs for eligibility. Some of the disabilities represented at our programs include: age-related disabilities, amputee, autism, brain injury (acquired or traumatic), visual impairments, hearing impairments, multiple sclerosis, spinal cord injury, muscular dystrophy, developmental disabilities, and psychiatric disabilities. The majority of our participants are adults; however, children participate in our programs frequently. Please feel free to contact us with questions about accessibility or for more information by calling us at 413-584-2052 or emailing us at info@alloutadventures.org. Every participant in our programs, including family members and personal care assistants, will need to fill out a liability waiver. Please download the form above and bring your completed form to the program. You just need to fill out the form one time per calendar year. CANCELLED TODAY DUE TO INCLEMENT WEATHER. We will hike along the accessible trail along Bray Lake at Mt. Tom with an option to go further along a more rugged trail if desired. “Trails” wheelchairs available by request. Pre-registration required. Please call 413-584-2052 to make a reservation or for more information. There is no fee for participation in Winter programs. Participation is by donation. UAP Cycling (Fridays in Hadley), $5 per program. UAP Paddling (Canoeing and Kayaking), $8 per program. 1 UAP Cycling program (Fridays in Hadley) and 1 UAP paddling program per week for the summer season. SHIP participants may purchase this pass to cover SHIP programs except camping. Pass does not cover programs for seniors, and Independent Cycling Program. Pay for UAP pass at program site with cash, check or card. Or mail a check to address below. Cycling and Snowshoeing, $20-5 sliding scale per session. For those who have already attended one of our cycling programs and have been matched to a cycle. You can come and use a trike from our office in Northampton. Riders must be able to independently, or with the help of a companion, be able to follow safe riding rules of the trail. Trikes are available 1-3 hours based on availability. Saturdays at AOA office in Northampton. Cost: $10 per person with a disability. All others $15-$25 sliding scale. UAP Summer Pass does not cover this program. $5/program, except camping trips. You can use UAP Summer Pass for SHIP programs. Each person with a disability can bring one caregiver at no charge. If a person with a disability needs two caregivers to participate, then that person can bring two caregivers at no charge. We accept cash, check or credit cards in person and online. Many different styles of accessible cycles are available for use at our weekly cycling programs throughout the summer, including hand cycles, tandems, adult tricycles, and cycles offering more significant seating support. Participants are encouraged to come try several bikes to find the one that’s most comfortable, with support from our friendly staff and volunteers. Cycling programs are generally held May through October (please refer to schedule for participation eligibility). Take a look at the program schedule on our home page and call All Out Adventures at 413-584-2052 and reserve a cycle. You can reserve a cycle for one hour during the program time. A few of the cycles are available for more than one hour based on availability. Ask the office for assistance in picking one out. Come to the program with your completed liability and medical waiver. Check in with the program staff. The staff will provide you with instruction and assistance. Call the program cell phone in case of mechanical difficulty. You can reserve a cycle for one to three hours based on availability. $15-20 sliding scale. $10 for people with disabilities. Donations most welcome! Your financial support - through individual donations, Valley Gives Day, and the Kayak-a-thon, - is allowing us to offer this program to people with disabilities and their family and friends, though we do not have any specific grant funding for it. Thank you! Wear closed-toed shoes like sneakers. Bring a backpack with a water bottle, salty or sweet snack, and cell phone if you have one. Properly-fitted helmets required. We provide them or you are welcome to bring your own. Please call or email All Out Adventures for more information and to register: 413-584-2052 or info@alloutadventures.org. In case of inclement weather, call our office number before you leave home for a recorded message about program status. 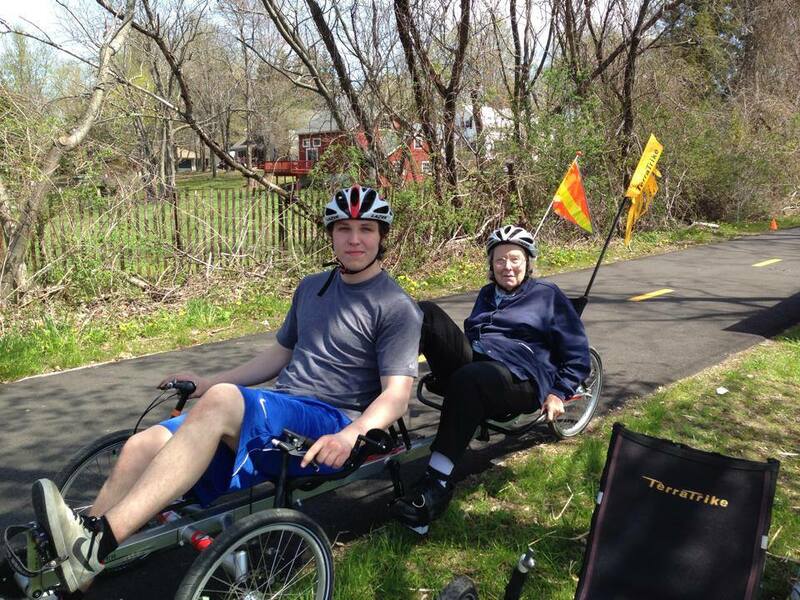 Tuesdays on the Norwottuck Rail Trail in Hadley: May 21, 28 and June 4, 2019 10AM-12PM. Funded by the Statewide Head Injury Program (SHIP), these programs are open to people with a brain injury, their family and friends. 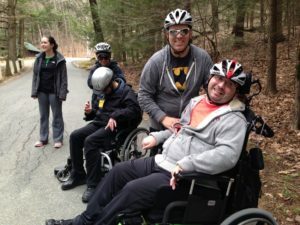 People with brain injuries and their family and friends are invited to join All Out Adventures for upcoming guided outdoor recreation programs including cycling and nature hiking. Cycling is a great way for people with brain injuries to get exercise, socialize with others, and enjoy nature. 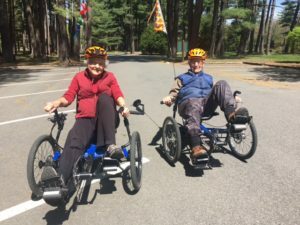 We can accommodate riders of all abilities with stable recumbent trikes, tandem cycles including a wheelchair tandem, hand-pedaled cycles as well as traditional two-wheel bikes. Participants can opt to go on a guided group ride or take out a cycle on their own with a companion. Nature Hiking—participants of all abilities will be able to access and explore nature on our guided nature hikes. 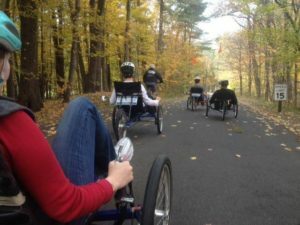 Our hiking program is accessible to those who use wheelchairs or have difficulty walking by using our all-terrain wheelchairs or recumbent trikes with mountain bike tires along accessible trails. Kayaking is made accessible with the use of recreational kayaks of various designs, including tandem kayaks. They are adaptable to individual needs and can be made more comfortable and stable with the use of pontoons and various other modifications. The program takes place on the flat water of the Connecticut River in Northampton. Call All Out Adventures for more information and to register at 413-584-2052. Or email us. SHIP programs are open to people with brain injuries and their guests. Cost is $5 per program except cabin camping. Equipment provided, but you must pre-register. Meeting times, locations and other details will be confirmed upon registration. All program sites are wheelchair accessible. Call us for accessibility information. Veterans and disabled members of the armed forces of all ages and abilities and their family and friends are invited to join All Out Adventures for our cycling program. Whether you're new to cycling, returning from a long absence, or already an expert, we have a wide variety of equipment that can be fitted to your needs. Come to the programs to get outside and enjoy the sun, fresh air and exercise! Our cycling includes the use of stable recumbent tricycles, hand-powered cycles, tandem tricycles and bicycles, a wheelchair tandem, as well as traditional two-wheeled bikes with added back support. The bikes and trikes can be sized and adapted to individual needs. The cycling programs will take place at Look Park near the VA hospital campus in Leeds. All program sites are wheelchair accessible and our staff are trained in biking instruction, as well as wilderness first aid and have extensive experience in backcountry/therapeutic recreation. 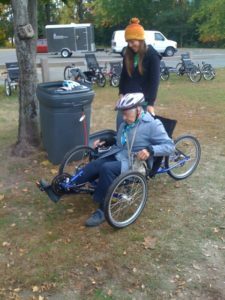 At all our programs we offer supportive services such as choosing and adapting the best bike for your size and abilities; assistance with transfers; tandem cycling companion if needed; staff will lead small groups in riding. There is no charge for this program. All the necessary equipment is provided (such as helmets), but we recommend you bring water, a snack/lunch, sunscreen and wear clothing appropriate for the weather and activity. This program is funded by the Veterans Administration with support and cooperation from the VA in Leeds, the Massachusetts Department of Conservation and Recreation's Universal Access Program, Look Park, and from donations from our participants. Veterans Kayaking and Stand-Up Paddle Boarding is over for the 2018 season. We look forward to starting again in July 2019. Registration for Veterans SUP and Kayaking will open on May 10, 2019.